My mom used cook a dish using only the combination of cucumber and yogurt a lot of times. So when I took a look at this recipe, I fell in love with it. I decide to try it as salad is must starter in our house for dinner. My hubby loves salad and everyday he or I make some if is he is making then his usual version. When I am in charge it will be some different one. We both hubby and wife loved this cucumber butter milk salad. I like the fact that it is very easy to make and you don’t need to make extra ordinary dressing to go with it. It is from the book “Victuals”. I got interested in reviewing this book because when I initially came to US for working, it was in the beautiful state of West Virginia. It was in the mountainous, curvy roads where I learnt to drive, and my instructor used to tell me if you able to drive here in West Virginia then you can drive anywhere. Yes he was right, you don’t know what is coming as the roads curves and turns every mile or so. I loved staying there. My first meeting with my hubby and our marriage was also in West Virginia, so that state is attached to my life in many ways. The book “VICTUALS: An Appalachian Journey, with Recipes”, by Ronni Lundy is about food people, and history from the Appalachian region of America. This cookbook is more about history and people then about food. The book starts with 6 pages of pictorials of beautiful greenery, followed by an introduction. There are 8 chapters, and the first one is Roots seeds which have roasted chicken and dumplings, Morsels and Ramps with eggs on toast, Roasted root vegetable with bacon and orange sorghum vinegar, Mashed potatoes, the sahck’s sweet and savory banana pudding, Kale potato cakes and ginger bread sounds interesting. Then the second chapter salt of the earth has Mary’s sweet and salty reward, pepperoni rolls, Miner’s Goulash, Smoked oyster-stew for two, Rosti and old fashioned vanilla ice cream are few. Third chapter is all about corn. Skillet corn, Appalachian sour corn, real cornbread and Fired cornmeal mush and buttermilk brown sugar pie are found interesting. Chapter 4 about Beans, Shuck Beans or Leather Britches, soup beans, succotash etc. Then there is buttermilk cucumber salad, which I tried it at home and we liked it. Fifth chapter 5 apple-achia is all about apple, from fried apples, fried pies, apple stack cake, and Sorghum and apple sticky pudding. The 6th chapter is all about preserving, old school tomato gravy, icebox green strawberry pickles, spiced pickled peaches and preserved lemons are few. Chapter 7 is about Husbandry, skillet fried chicken and milk gravy, pork chops, buttermilk biscuits, roasted pork shoulder, chipped country ham and gravy and winter vegetable stew with Ham seasoning looks delicious. Eight and final chapter is Appalachian spring, sumack oil flatbread with country ham and pickled ramps, busy day cobbler are interesting. If you are looking for only recipe cookbook then this not the one for you, on the other hand if you are looking to know about a region and its culture and food then grab this book. It has simple recipes with no complex steps or gimmicks. I tried cucumber buttermilk salad from it, is filling and delicious, you will like it. Here comes the recipe. 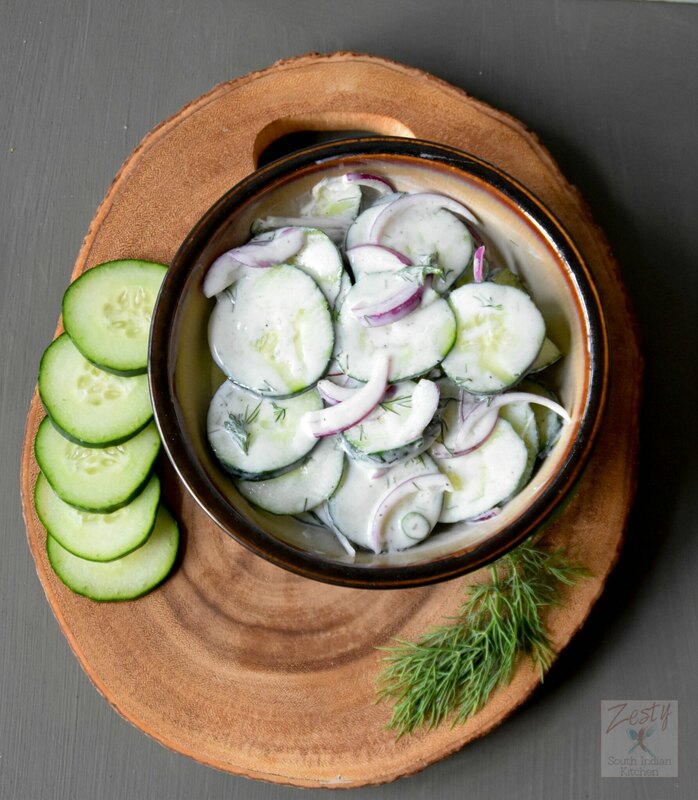 Simple yet delicious salad made with buttermilk, cucumber and onion and dill. with onion, buttermilk, dill, vinegar, salt, sugar, green chili, and black pepper. Cover and refrigerate the salad for 20 -30 minutes to allow marinate and serve cold. This looks so refreshing – perfect for hot summer days! I love cucumber salad! My grandma used to make one very similar to this! Looks delicious! What a delicious and tasty salad and the book sounds really good, I like books that share history and culture together with recipes. Swathi, I know I’ll love this salad! Very similar to one my grandmother made. And thanks for telling us about this book. I’m going to check it out. yummy and refreshing salad!! tempting clicks!! Yes this will be great with spiced pilaf rice, chickpeas , you are right cucumber raita is delicious. 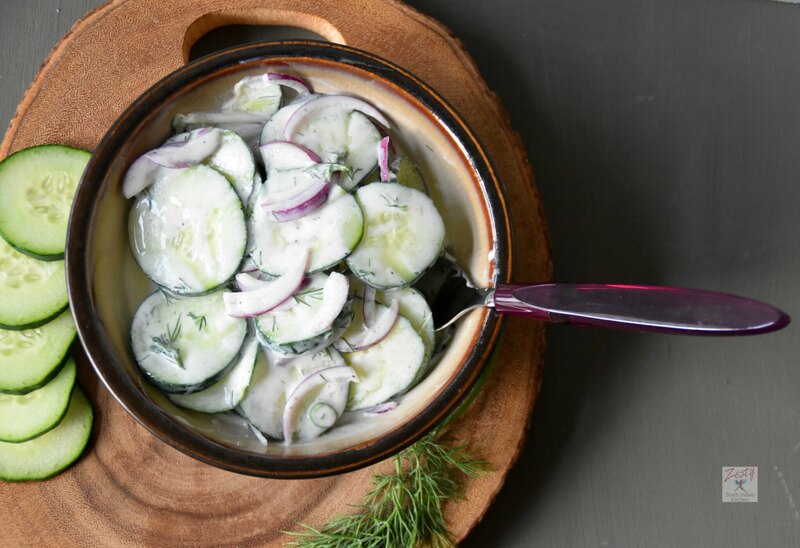 Cucumber and Buttermilk salad looks awesome. Coolant to the body….